Cover the top Taurus Mountains sights in a single visit—without dealing with the hassle of car rentals. Travel comfortably in an air-conditioned minibus as you stop in two traditional villages, with a break for Turkish coffee. 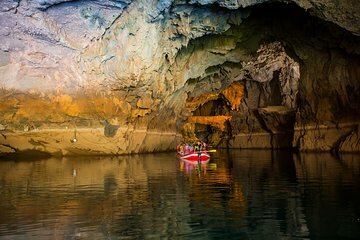 You’ll get a close peek at Golden Cradle Cavern during a subterranean boat ride. The tour includes a local lunch, a look into an Ottoman-era mosque, and a visit to Turkey’s famed button homes.